Some many years ago, I interviewed for a job in Vienna. The individual whom I was to replace was an Englishman bedecked in an aura of weariness that Englishmen wear so well, like a comfortably wrinkled suit. He told me that he had come to admire the Austrians for their marketing genius, what with having convinced the world that Beethoven was Austrian and Hitler was German. I was reminded of this recently, in a discussion about socialism, during which it stuck me that socialists exhibit a similar genius. It is much less inflammatory to call someone a socialist than it is to call someone a terrorist, a racist, or even a statist, even though tens of millions of humans have died in the name of various brands of socialism, whereas the victims of terrorism number in, perhaps, the tens of thousands. This is not to excuse any brand of collectivism—be it tribalism, nationalism, ethnocentrism, or boosterism—but it should be unexceptional to declare it worse to kill 20 million than to kill 3,000. To put this to the test, utter the name Pinochet and then the name Lenin during an argument over politics and note the differences in reactions. Pinochet is credited with killing about 3,000 individuals; Lenin, millions. And yet, university students can write term papers on Lenin that are generally supportive of Bolshevism, whereas the same—mutatis mutandis—is not true of Pinochet. Better yet, socialists have convinced a great number of individuals that some salient difference exists between ‘right-wing’ national socialism and fascism and ‘left-wing’ international socialism and communism. Both Hitler and Stalin engaged in systematic genocide; so, that does not distinguish them. Nor do secret police, purges, the suspension of fundamental human rights, etc. About the only policy difference between ‘right-wing’ and ‘left-wing’ socialism is that under ‘right-wing’ socialism individuals retain title to property, and under ‘left-wing’ socialism private property is abolished, and everything belongs to the state. Under both systems, the disposition of property is dictated by the central authority’s agents. Under fascism in Mussolini’s Italy, the farmer owned the cow, and an agent of the state dictated whether the cow was to be milked or slaughtered, and how the resulting products were to be distributed; under communism in Castro’s Cuba, the state owns the cow, and an agent of the state dictates whether the cow is to be milked or slaughtered, and how the resulting products are to be distributed. And yet, here we are, surrounded by individuals who are emboldened to speak of Marx, Lenin, and Castro with a warmness that one would be surprised by, if the subject were Hitler, Mussolini, or any 20th Century Latin American military dictator. This is relevant today, because this false distinction is used to silence critics of statist policies. For example, on the one hand, critics of ObamaCare who decry it as socialistic—meaning, implicitly, left-wing socialism—can be shown to be incorrect, because The Mandate that requires US residents to transact with commercial insurance firms under penalty of a ‘tax’, the non-payment of which would be a felony, is not the same thing as nationalization. No nationalization, no socialism; QED. On the other hand, if someone correctly describes ObamaCare as fascistic—not totalitarian, racist, or genocidal, but in the sense of a government policy that puts the needs of the nation above individual rights, as determined by a very few individuals who wield supreme power—as Whole Foods CEO, John Mackey has done, the backlash is swift. Check, and mate. It isn’t socialism. 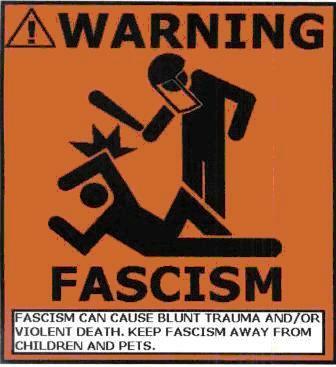 You cannot call it fascism. Rather than address the substance of the criticism, the message of the backlash is more akin to whipping the little boy who dares to point out that the emperor is wearing no clothes or the dog that exposes the scare little man behind the curtain pretending to be a wizard. This obsession with trivial distinctions between ‘right-wing’ and ‘left-wing’ collectivism that statists use to distract the conversation from substantive issues puts individualists at a rhetorical disadvantage. Call a statist a statist, and one is perceived as shrill; call an individualist an individualist, and it comes across as meaning something benign, like not keeping up with fashion trends or maybe listening to unpopular music. Call a socialist a socialist, and one might inspire a discourse on the moral superiority of the proletariat over the plutocracy. Call a fascist a fascist, and the knee-jerk assumption is that one means that the other party is a murderous racist. We are left with relatively unfamiliar terms, like ‘corporatism’ or the ungainly neologism ‘crony capitalism’, neither of which captures the essence of being compelled to dispose of one’s property according to the dictates of individuals who do not bear personal cost for their decisions. Little is to be done about this situation, other than to be aware of it, to recognize it when it happens, and to avoid being distracted by activists’ misdirection. The Huffington Post has a story by Greg Lukianoff, president of the Foundation for Individual Rights in Education, that describes an intriguing situation at the University of Wisconsin – Stout, in which a professor has been threatened with legal action for criticizing fascism.